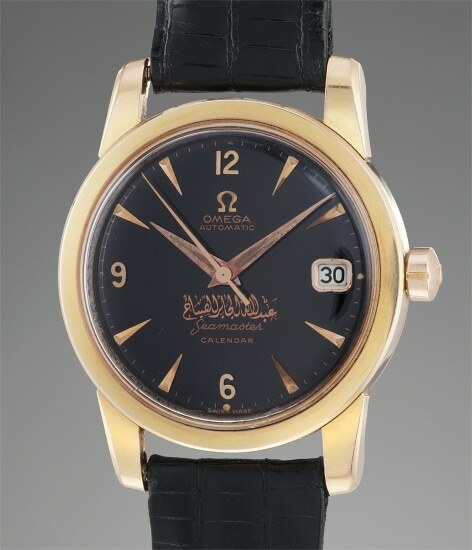 Accessories: Accompanied by original fitted box, outer box, product literature and Omega Extract of the Archives confirming production of this watch on April 14, 1959 and delivery to Kuwait. Preserved in absolutely superb condition (with original strap and buckle still present), this Seamaster is a rare model in pink gold with beautiful galvanic dial. Its rarity is further enhanced by the striking signature of Sheikh Abdullah Al-Jaber Al-Sabah, a member of the Kuwaiti royal family. Considering the fact that the watch is in gold we believe that it was ordered as a gift to be offered by the prince to important dignitaries and members of staff. Launched in 1948, the Omega Seamaster is the oldest line in the manufacture's current collection. Fitted with a waterproof patented case, the model was initially made for the British military at the end of World War II. It then became the robust yet elegant watch in the Omega repertoire. Sheikh Abdullah Al-Jaber Al-Sabah was Kuwait's first Minister for Education after independence in 1961. During his tenure, he led great educational and cultural reforms in the country, opening the first National Museum and creating Kuwait's first university amongst others. The present hardly ever seen model impresses with its condition and rare and appealing combination of pink god case, black glossy dial and signature on the dial.